Visiting US Secretary of State, John Kerry, today praised the Sultan of Sokoto, Alhaji Sa’ad Abubakar, for promoting religious tolerance and understanding among Nigerians. Kerry praised the monarch while delivering a speech on Resilient Communities and Religious Tolerance in Countering Violent Extremism. According to Kerry, the Sultanate Council was building a community of tolerance for peace, progress and political stability in Nigeria. 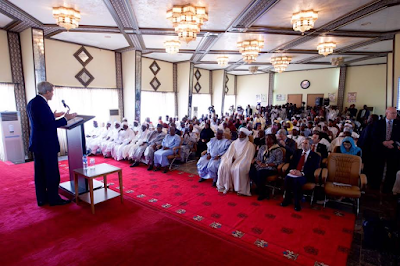 He said that the United States would continue to identify itself with the Sultanate in strengthening religious tolerance and understanding among Nigerians.